Several graduate students, particularly the ones looking to move out of academia, are often bombarded with the same question toward the end of their program: What should I do if I am not planning to stay in science? Will my skill set be enough to secure a job other than a post-doctoral fellowship? These are valid questions and there is no one correct answer but I can try to give an answer based on my experience. I started my graduate program in Canada a while ago. It has had its own share of ups and downs. I was not clear on where my program was heading. During these particularly difficult times, having a hobby did help. Be it beach volleyball or inner tube water polo I always found something to help me de-stress. I am not a very athletic person but recreation sports kindled my interest. It had nothing to do with staying in shape or for the sake of getting attention on social media. Rather it had to do with an opportunity to mingle with people from various faculties and also a great way to de-stress especially on days when experiments failed. Now let me be honest here and say that when I was back in India, I was NOT a social butterfly. I preferred keeping to myself and just doing what’s necessary to excel in school. However when I moved to Canada for my graduate program, I was taken from an environment where I was too comfortable and put in one where I barely knew anyone. I essentially had to start from scratch. I could have kept to myself but I chose to do things differently. Along with team sports came opportunities to head teams. This helped improve my communication and leadership skills along with time management. Additionally I got to meet a great set of people whom I would have never met otherwise if I had stayed put. I have been doing this here at the University of Alberta for over 5 years now and as much as it is a huge time commitment it has been a worthwhile experience. In the meantime while I was pursuing my graduate program as well as managing recreational league sports, I won a scholarship through NSERC-CREATE. It was a joint program between University of Alberta and two German universities. It paid for my stipend and also offered me the chance to travel to Germany, attend various international conferences, and conduct research in a partner lab,. The terms of reference of this scholarship required awardees to participate in several professional skills development workshops such as drafting an ideal resume, working on a 30-second sales pitch, and input on working for a forensic lab/pharmaceutical industry. It was a very rewarding experience. The scholarship program wasn’t just focused on academia. I was part of the Graduate Student Association that handled the social aspects of this program, particularly with respect to the students who travelled from Germany to work in our laboratories. I single handedly managed accommodation arrangements for several students and drafted a “Survival guide” for the exchange students so that their transition to Canada was smooth. I also organized several events including visiting speaker events, all of which contributed to my current skill set. It was definitely not easy balancing everything but what we fail to see is that the graduate program trains us well with respect to organization and time management. These events were more like a practical application of the skill sets that I had acquired over the years during my studies here at the University. As I was juggling activities during my program I got to meet a project coordinator on a ski-trip in British Columbia. This was merely a chance. He was very impressed with my ability to socialize and also throw a surprise event for a common friend of ours. (Something that wouldn’t seem like a big deal to most of us). A year later he contacted me and asked if I would be interested in working as his assistant for 5 weeks to help organize the 2016 Gairdner Symposium on Cancer Research. I was delighted and worked very hard because I wanted to impress him and his bosses. I thoroughly enjoyed the work. Much to my surprise at the end I was offered a part-time position as a Research Assistant and I have now been working there for almost 7 months. My job requires me to organize seminars, attend board meeting with large foundations, work on financial reports, and even organize a Research Day (which turned out to be a grand success). Again this highlights the importance of networking and not being afraid of communicating with people you’ve not met before. One of the things that grad school fails to train us on is our people skills. Since we are so preoccupied with experiments, grant writing, and papers we don’t set aside time to develop our social skills. Even if you wish to stay in academia and end up setting up your own lab, you will need the help of others to succeed. If you wish to start a collaboration with someone your ability to interact with the other person and the way you sell your ideas will work in your favor no matter which field you end up in. Try to embrace your hidden talents because you never know when an amazing opportunity will come your way. Of course it doesn’t work out the same way for everyone. Each person is gifted in a different way. It will be overwhelming at first and will take a lot of work to figure things out. I will not lie. There will be a point in time where you will think if all this hassle is worth it. However, the only way you can discover your “hidden” abilities is to drop all restrictions and put yourself in a position where you are forced to evolve and develop strengths in areas you were lacking before. It may not always land you a job but these skills will be something that you will apply in the future whatever line of work you end up in. There are many opportunities out there for graduate students. Some people feel that having a PhD means that you should only pursue those jobs that are ranked high among academics. Truth be told, every job is important and we all work together to succeed as a community. Everyone has to start somewhere. 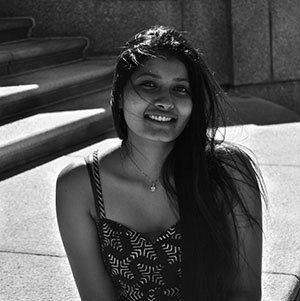 Aruna Augustine is a graduate student at the University of Alberta. Her interests include cancer research, scientific event planning and project coordination. She currently lives in Edmonton, Alberta and can be contacted via email: aruna@ualberta.ca.